Good morning from cold Hamburg and welcome to our Daily FX Report on Thursday. Today, the GBP is in focus. Furthermore we have data about the unemployment rates in the U.S. and Australia. As every time, we wish you much success today. Today, the Bank of England plans to spend 200 billion GBP on bonds to support Britain’s recovery from the recession. The Governor Mervyn King will keep the purchase program unchanged. The gross domestic rose 0.2 percent in the last quarter. It seems that the economy has escaped the recession and Mervyn King wants to ensure that. The GBP could climb against the JPY and traded at 143.73. Furthermore the GBP rose versus the USD and reached 1.6301. The EUR and the JPY rose against the USD on speculation that an improving economy will allow the European Central Bank to exit its accommodative policy before the Federal Reserve and the Bank of Japan. The AUD climbed for a second day after a report showed that the employers added more jobs as expected. The unemployment rate dropped to 5.7%. The U.S. economy fell into its deepest recession since the Great Depression in December 2007. More than 7 million jobs were cut in comparison with 2007. The current unemployment rate is 10%. 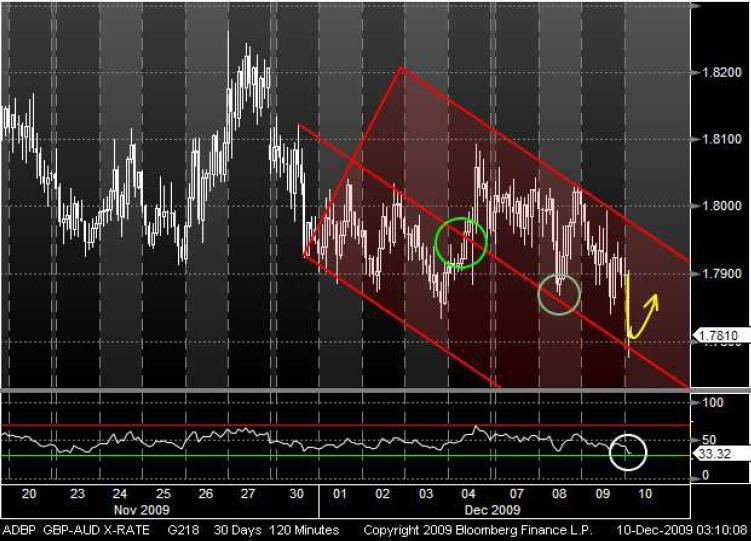 Since the beginning of December, the GBP has been trading in a bearish Andrews Pitchfork channel against the AUD. Recently, the currency pair touched the middle line and could recover at 1.7778. 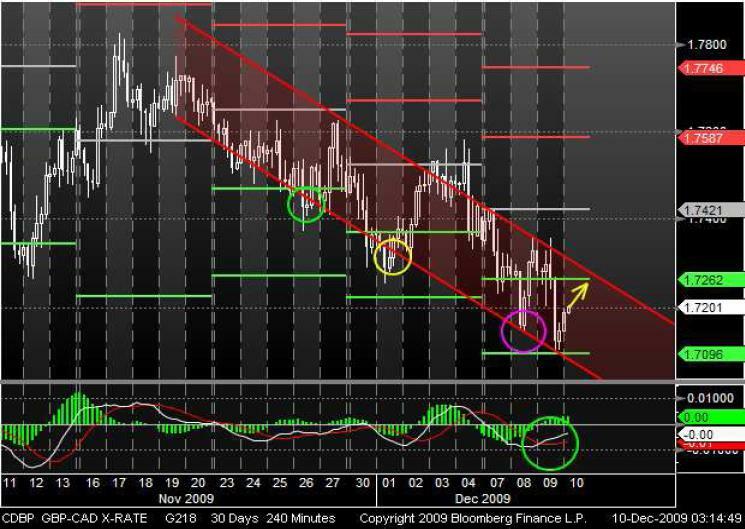 At the moment, it seems that the GBP could rise for a short term like the two times before as the prices reached the middle line from the trend channel. Also the RSI may indicate an upward trend. In the middle of November, the GBP dropped out of its upward trend against the CAD and has been trading in a bearish trend channel. During that time as the prices touched the bottom line, the GBP could recover. The currency pair broke its Pivot point and reached the upper line from the trend channel. Also a crossing MA Oscillator through the signal line from below may support an upward movement.